At Rs. 1.6 lakh, the ABS version is costlier by approx. Rs 9000 over the non-ABS version. KTM India recently launched the 2019 KTM 200 Duke ABS (anti-lock braking system) version. The entry-level naked sports bike comes with a price-tag of ₹ 1.6 lakh (ex-showroom, Delhi). The new KTM 200 Duke gets the ABS system supplied by Bosch. The best-selling Duke is available in three color options namely Orange, White, and Black. Soon, the mandatory ABS law is about to come into force. The new law will commence with effect from 1st April 2019. This makes it mandatory for all the bikes above the 125 cc displacement to offer ABS as a standard. The bikes below 125 cc displacement need to have the CBS. However, until then, the older non-ABS version of KTM 200 Duke will also be available for sale which comes at ₹ 1.51 lakh (ex-showroom Delhi). Commenting on the introduction of the 200 Duke ABS, Amit Nandi, President (Probiking) at Bajaj Auto said, "With the addition of ABS our customers will now have choice of both ABS and non-ABS versions on the KTM 200 Duke." The KTM 200 Duke ABS gets power from the same 199.5cc, single-cylinder, liquid-cooled engine. The engine is now BS-IV compliant. However, there is no change in power output. The motor delivers 24.6bhp at 10,000 rpm and 19.2Nm of torque at 8000 rpm. The engine is mated to a 6-speed gearbox. When KTM launched the 2017 model, the bike weighed 5kg more than the earlier version. So, the new ABS edition of the bike is likely to add some more weight. 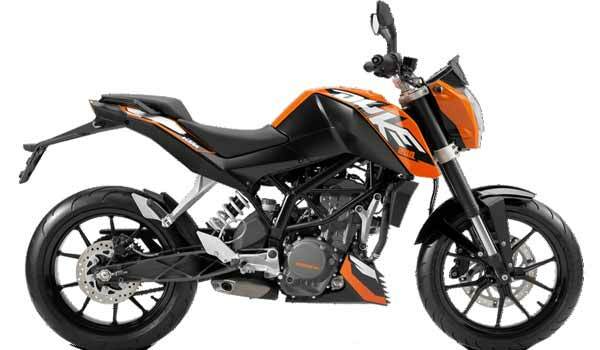 Other features and equipment will remain the same as the non-ABS version of the KTM 200 Duke. The bike has single trellis frame painted in black along with an aluminum swing-arm. 43 mm USD (up-side down) WP forks at the front and rear mono-shock suspension handle the suspension duties. A 300 mm disc brake up front and 230 mm disc at the rear take care of the braking. The bike also gets the same 17-inch alloy wheels which come with MRF tires. It has the tires of size 110/70 R 17 for the front and 150/60 R 17 size for the rear. For more information on 2019 KTM 200 Duke ABS, please click here.